1) Buy custom amounts. Ask for two slices of cheddar at the deli, or 1/8 lb from your cheesemonger. 2) Freeze hard grating cheeses like parmesan or pecorino romano in small containers (I’ve seen 1 to 2 oz condiment cups with lids in kitchen supply stores) or cut into chunks and place in freezer bags. Pull out a small container or chunk the day before and they’ll be ready before you’ve boiled the pasta. Visit Trading Up Downtown today to enter a chance to win a copy. You do have to tell us what you favorite meal for one is, though. I was a little surprised by the oatmeal! Oddly enough, I think of cold cereal for supper but not cooked cereal. Great empty pantry option, though. A rice cooker is (surprise!) an excellent tool for cooking rice. It’s also easily used to cook other whole grains, steam vegetables and/or proteins, and assemble a one pot meal. While I find it difficult to cook just one or two servings of rice in a full-sized saucepan, a small rice cooker makes it a relaxing process. Ask yourself a few questions to determine whether you might find it useful. September 14, 2011 Got an Auction? Leave a comment. 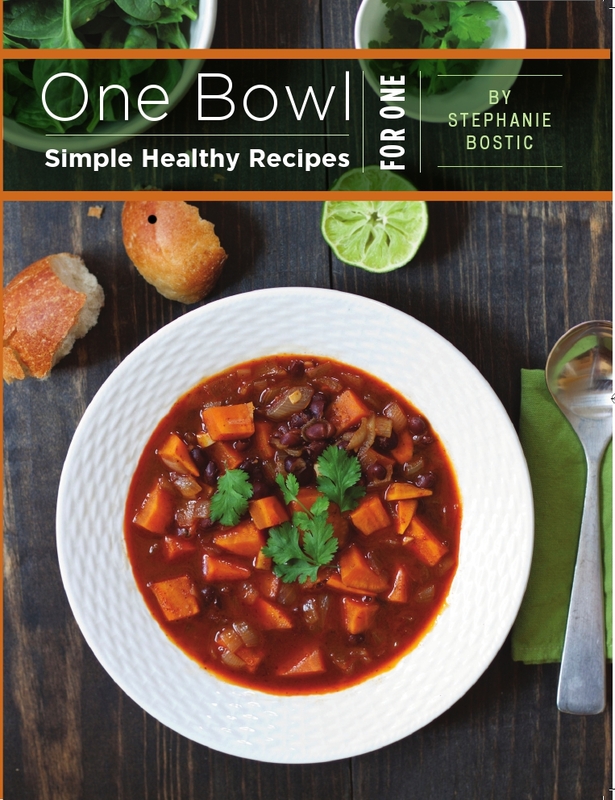 A selected number of copies of One Bowl are available for donations to charity auctions. Want to see (or bid on) one at your favorite event? The entry deadline is Nov. 1, 2011. Fresh ginger can add a serious shot of flavor to peanut sauces, stir-fries, curries, marinades, or dressings. However, it’s one of those seasonings that can be a bit of a pain to store since it can become moldy quite quickly. Or just dried out and hard to deal with. Solution: Grate the ginger, pack in a jar, and cover with rice vinegar. Refrigerate, and use within about 4 weeks. Rice vinegar acts as a preservative and most savory recipes calling for ginger can tolerate a few extra drops of it. White wine or cider vinegar could also be used, but I do prefer the rice vinegar for its mild flavor.